Paleobiology publishes original contributions of any length (but normally 10-50 manuscript pages) dealing with any aspect of biological paleontology. 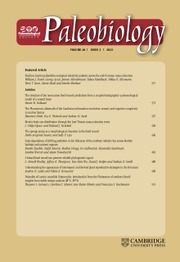 Emphasis is placed on biological or paleobiological processes and patterns, including macroevolution, extinction, diversification, speciation, functional morphology, bio-geography, phylogeny, paleoecology, molecular paleontology, taphonomy, natural selection and patterns of variation, abundance, and distribution in space and time, among others. Taxonomic papers are welcome if they have significant and broad applications. Papers concerning research on recent organisms and systems are appropriate if they are of particular interest to paleontologists. Papers should typically interest readers from more than one specialty. Proposals for symposium volumes should be discussed in advance with the editors.